You are here: Wade Thomas Parents Association > Programs > All Posts > Featured > Photos needed for Yearbook! Calling all parents!! 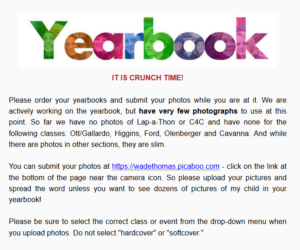 Have you seen the latest yearbook update in our Newsletter? Stephanie needs (lots!) more pictures. Please check your phones, search your clouds, look wherever you may have those cute photos of your child and classmates – and send them in!